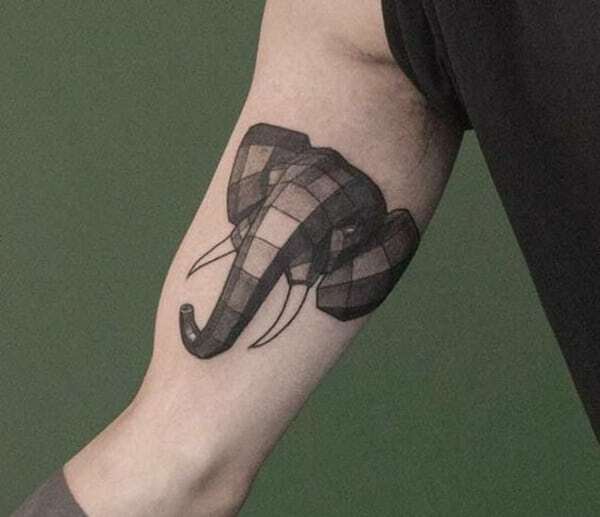 If you are looking for a unique tattoo involving animals, then try elephants on for size. The elephant is one of the biggest animals in the animal kingdom, and we love them to death! These animals are on of the strongest out there. 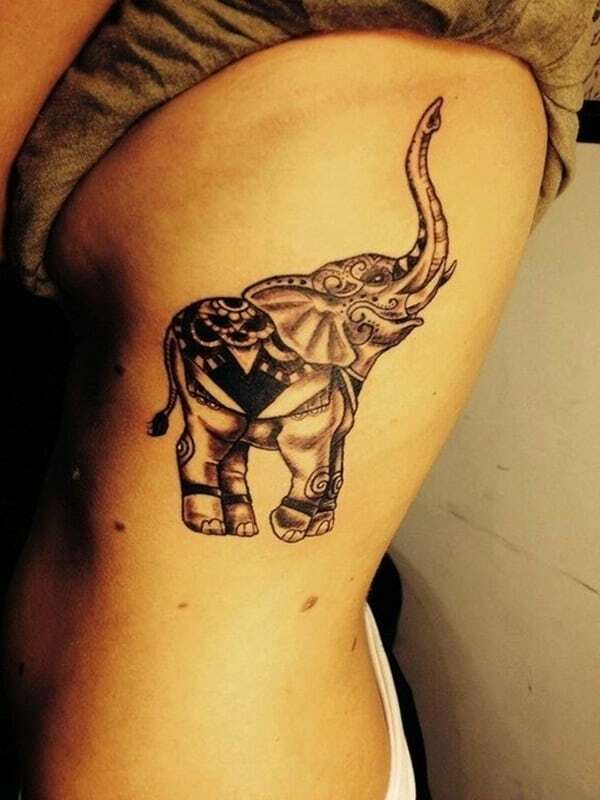 There are many different meanings behind the elephant tattoo because it’s a symbol of strength. 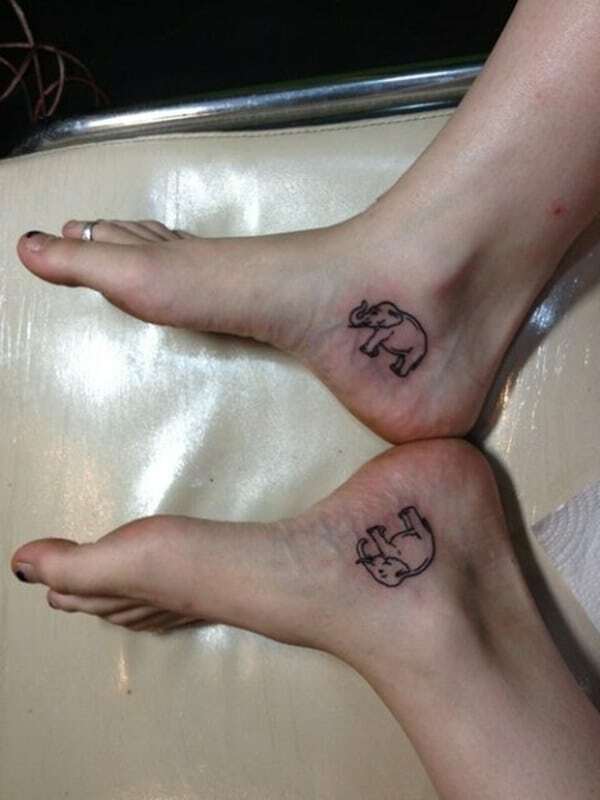 Elephants symbolize many things, like nature, attitude, prosperity, and strength of character. They are known to be one of the calmest beings on earth, and that is shown in their stature. They are one animal that is shown respected in numerous countries because of what they offer to the world. Countries such as Africa and Asia have large quantities of elephants. Some countries even worship the elephant because of its strength. The elephant is considered to symbolic of Lord Ganesha. 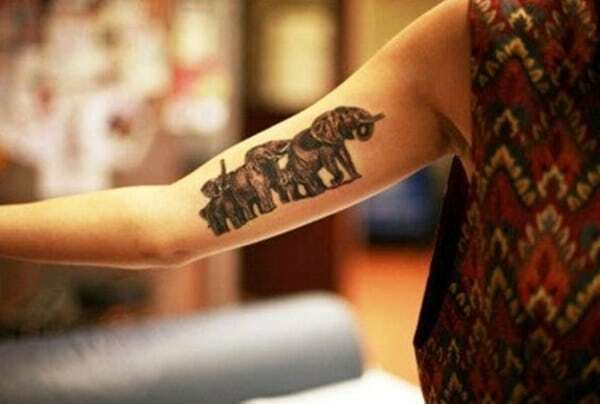 Getting an elephant tattoo is one of the most popular tattoos in the world, throughout many different cultures. Both women and men typically get these tattoos because they can be made tough or feminine. You can get these tattoos, small large or medium sized. You can have many different elements and colors to your tattoo. There is a spiritual connection between elephants and God as well as Buddha. 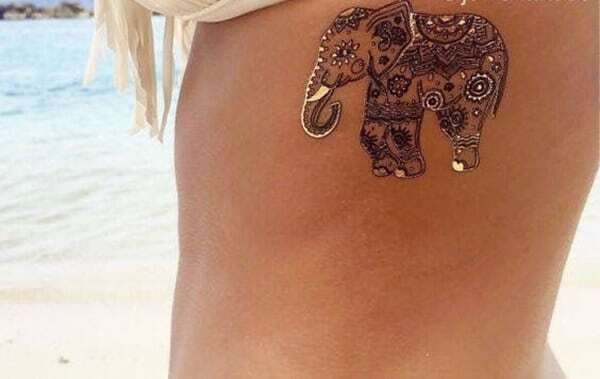 These tattoos can be inked just about anywhere on your body. Once they are completed, they can be very beautiful tattoos. This geometric design has shapes and colors involved in it. 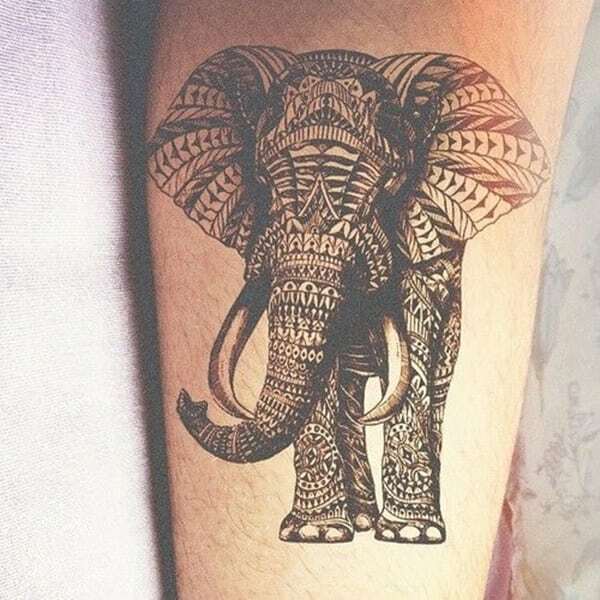 There is an elephant head in the middle of the design, and overall it’s a pretty great design. 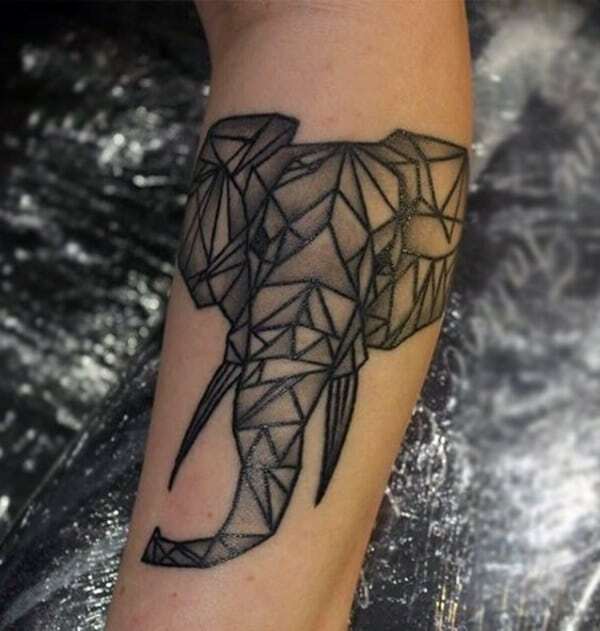 Another geometric tattoo design that looks great on the arm. 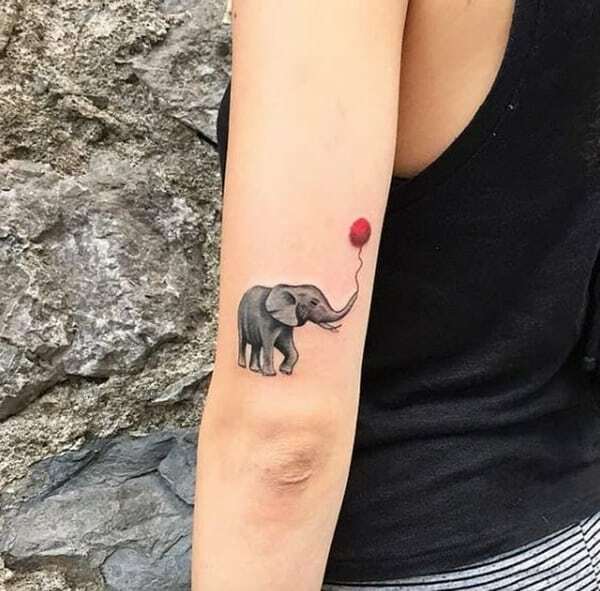 A great elephant design where it has a bright red balloon. I love the bright balloon he’s carrying. 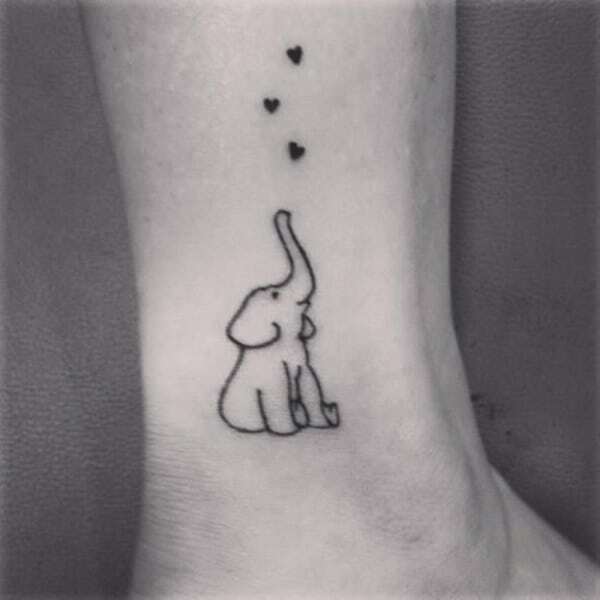 This little elephant looks cute on the ankle. A great design that is sure to make you smile. 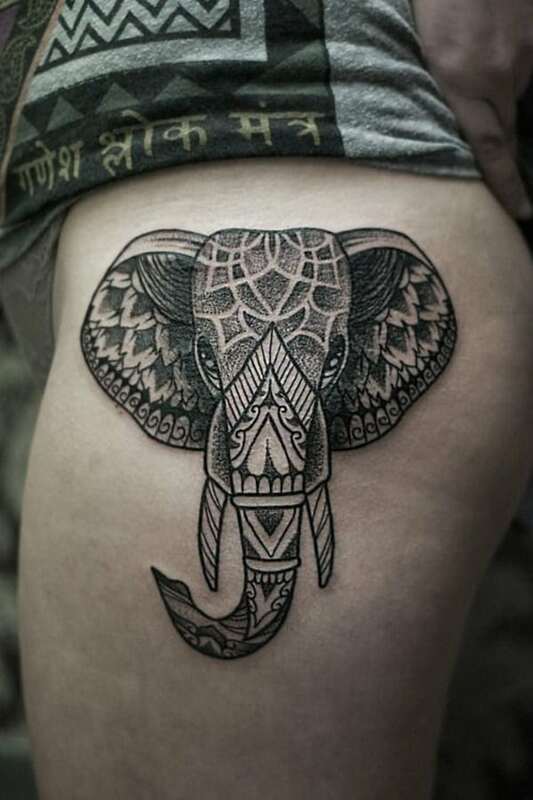 This great elephant has some awesome details and a one of a kind look. 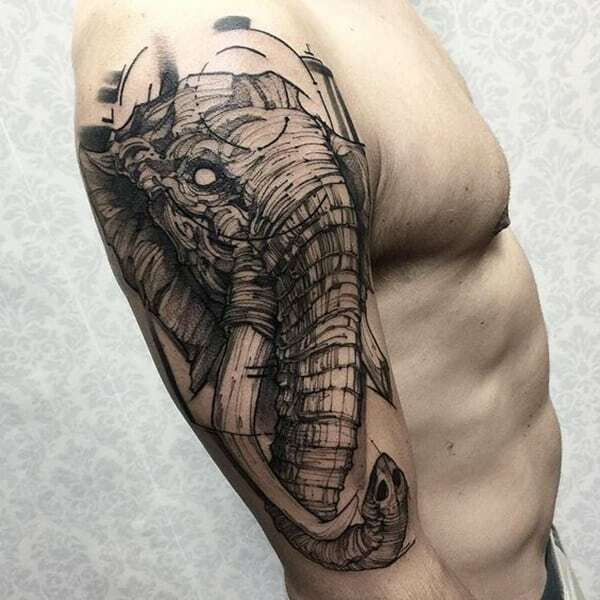 Half of an elephant and it’s very detailed. 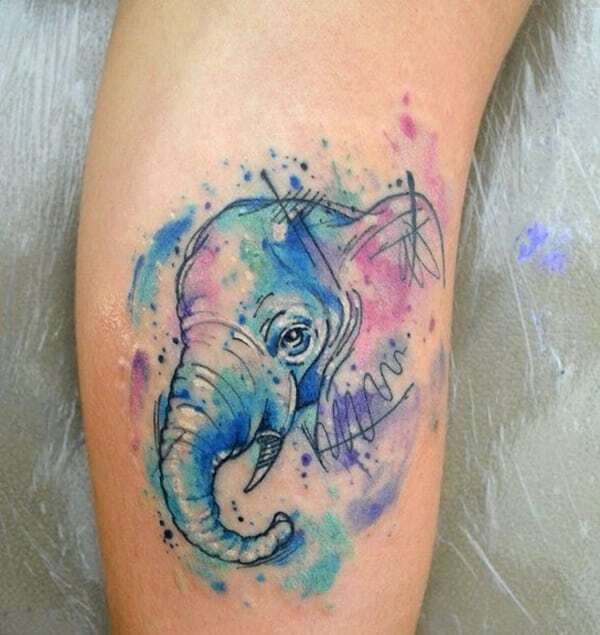 I love the great blue colors surrounding the elephant. 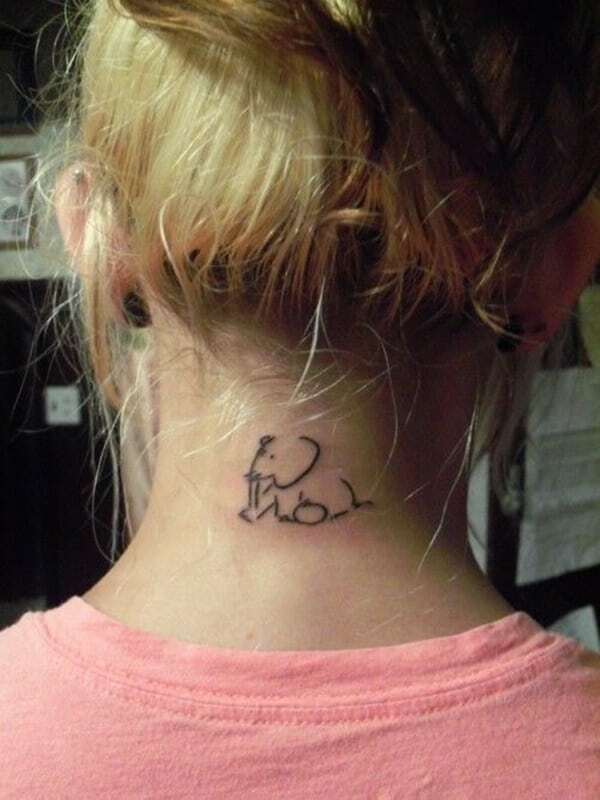 This great elephant outline is sitting quietly on the neck. It’s a design that can remain hidden or put out for show. You don’t get a cooler design than this one; the shading is just incredible. 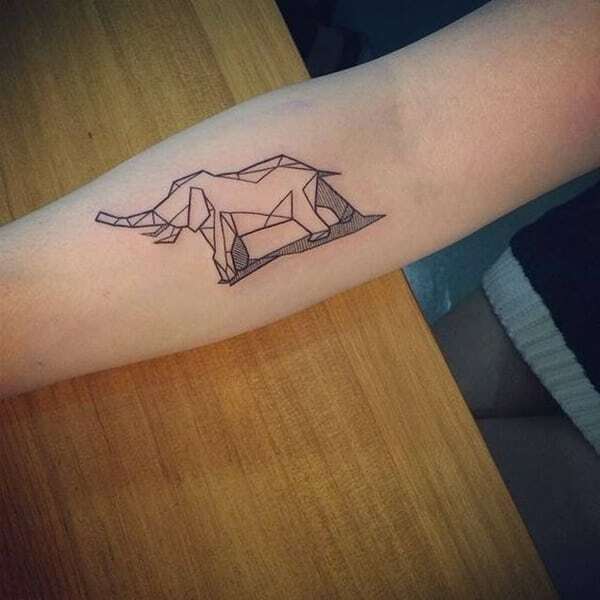 I love these geometric tattoos that can create an animal out of shapes. It’s amazing. This elephant has a lot of detail to it, and it is adorned with a headpiece. If you are looking for a special design, then this is it. 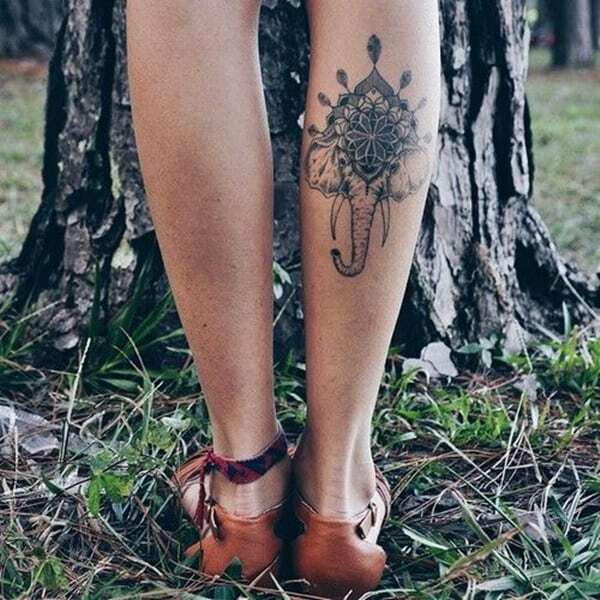 A great tattoo design that can show off your calm side as well as your crazy side. 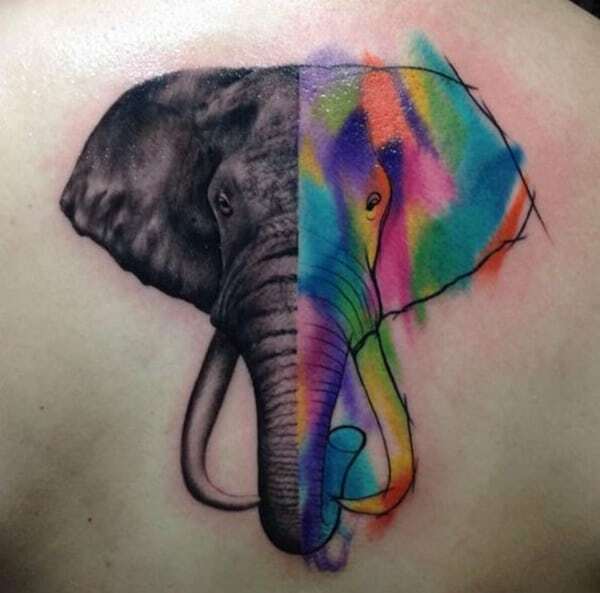 There is a realistic and detailed tattoo design on one side while the other is fill with bright, beautiful colors. The colored side doesn’t stay in the lines while the other is perfectly lined. This design is very different from the others. It’s not detailed, but it has its own unique design. This elephant is a great one because it has a lot of ornate detail to it. It creates quite the original design. 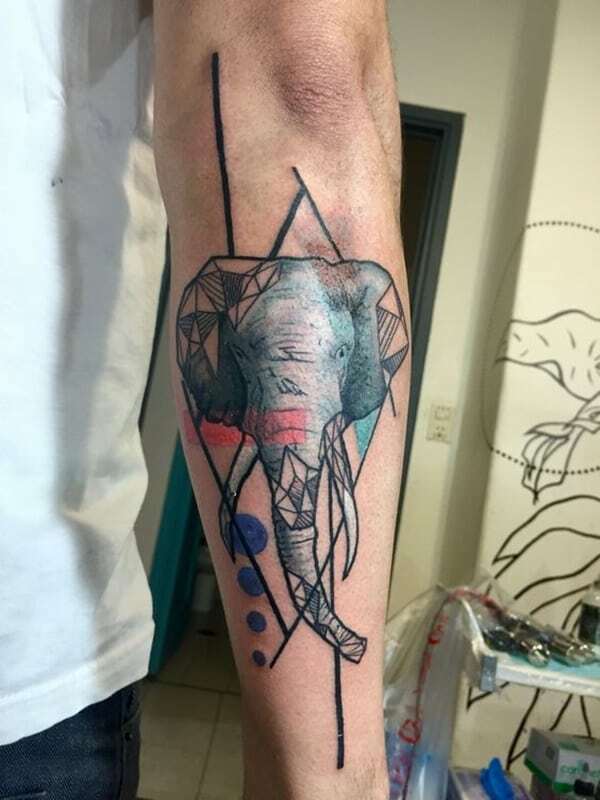 A great tattoo design that not only has a detailed elephant and some great colors but there are many geometric shapes throughout the design as well. This is the best area ever for this tattoo design! 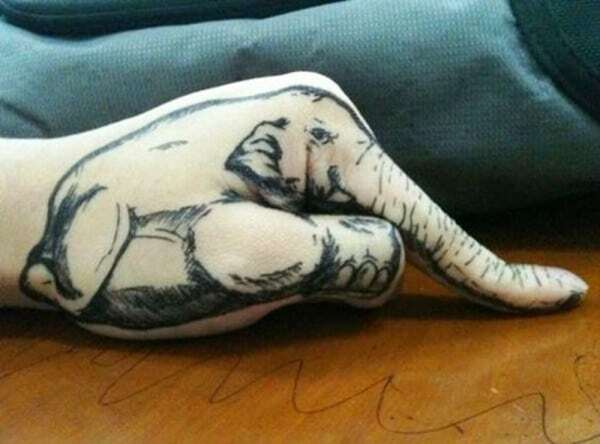 Make your own creative design and position your elephant so that the trunk is your finger. 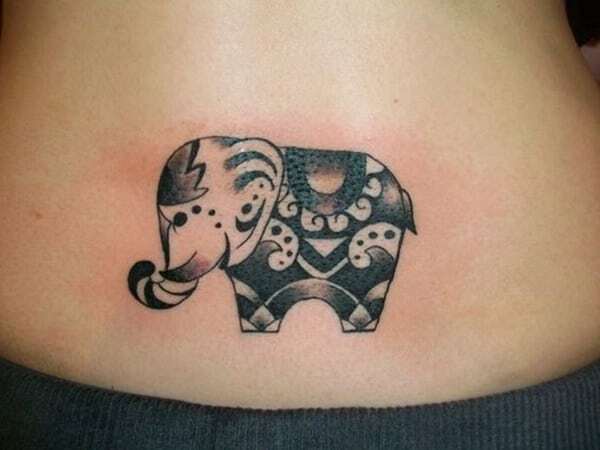 I love this geometric design; it’s small but powerful, and it even shows a shadow underneath the elephant. A great design that looks great as just an outline. 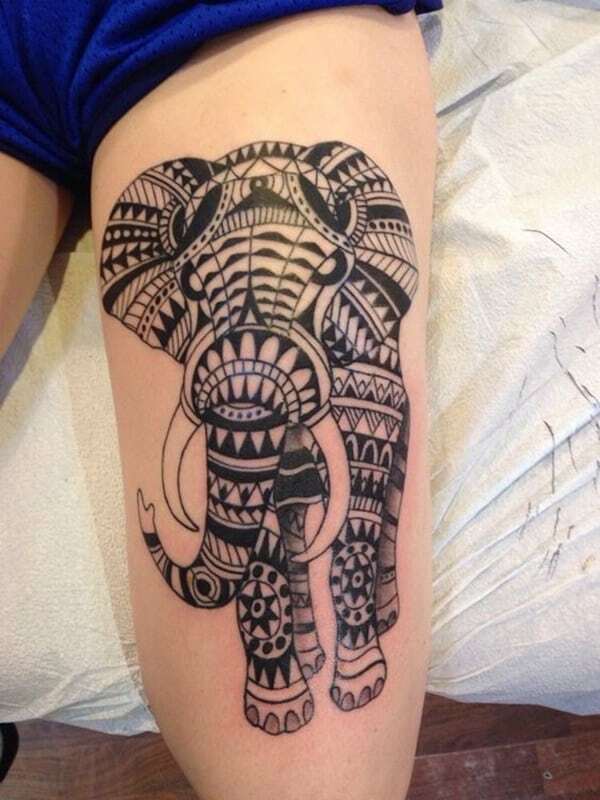 There is no need for color to make this elephant pop. 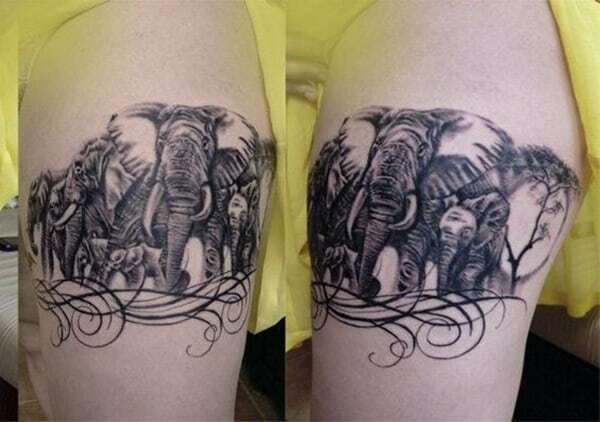 A great elephant tattoo that has many different themes to it. It’s the kind of elephant that we expect to see at the circus. These gorgeous tattoos have so much detail that they are very realistic. If you want a special tattoo, then this is the one for you. I love the baby elephant in the front. 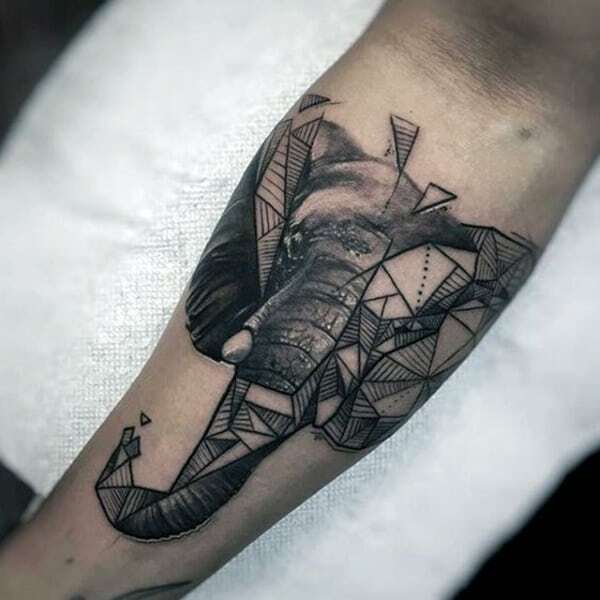 Another example of a detailed elephant within a geometric design. These are always great tattoos to have. 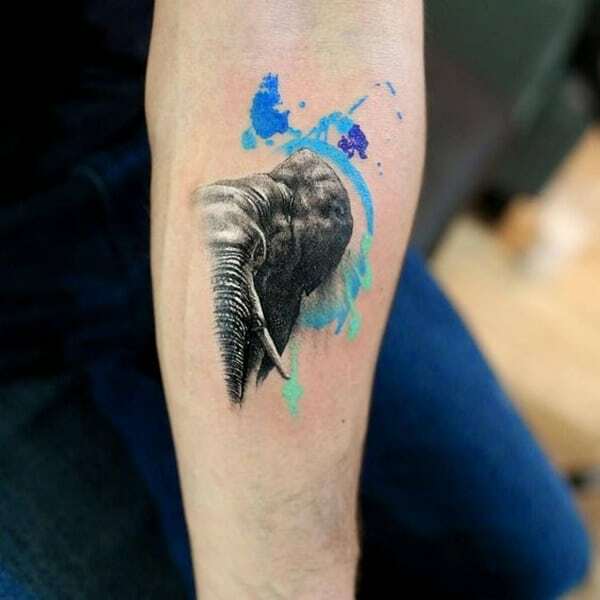 A drawing of an elephant on top of some great watercolor designs. The bright colors behind make for a great tattoo. 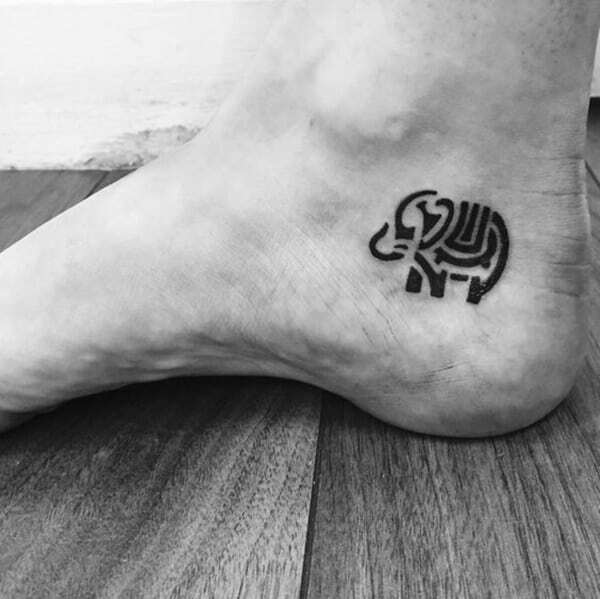 This ankle tattoo is a small and unique because of the tribal designs. 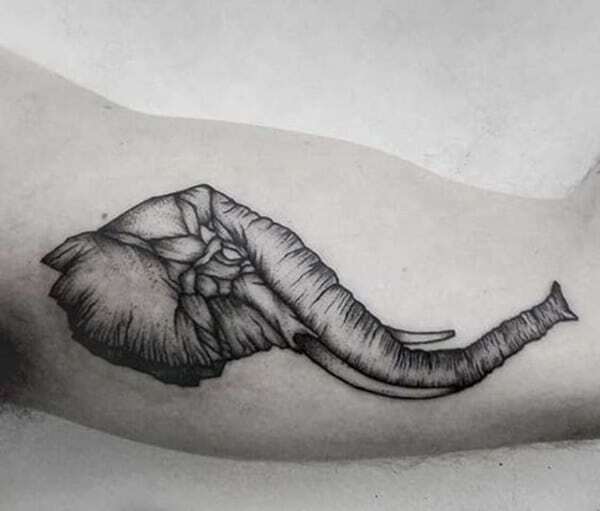 A great design that shows creativity when it comes to an elephant tattoo. This chest design looks dark, almost sinister. If you are looking for a cool design, then this is the one for you. There are many different design elements within the elephant. 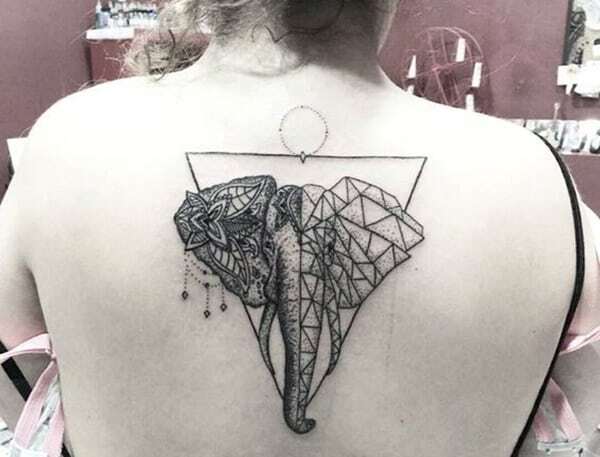 This geometric tattoo only belongs on one-half of the tattoo while the other half is a detailed elephant. It’s a very cool design overall, and one that is sure to draw the eye. This very detailed side profile of an elephant looks strong and powerful. It’s a weathered look that speaks of years of experience. This balloon elephant is awesome because it’s legs grow quite thin and become the bottom of the balloon ride. It’s a great design that looks amazing on her shoulder. These small designs fit perfectly on the foot. If you want something cute and subtle, this is the design for you. 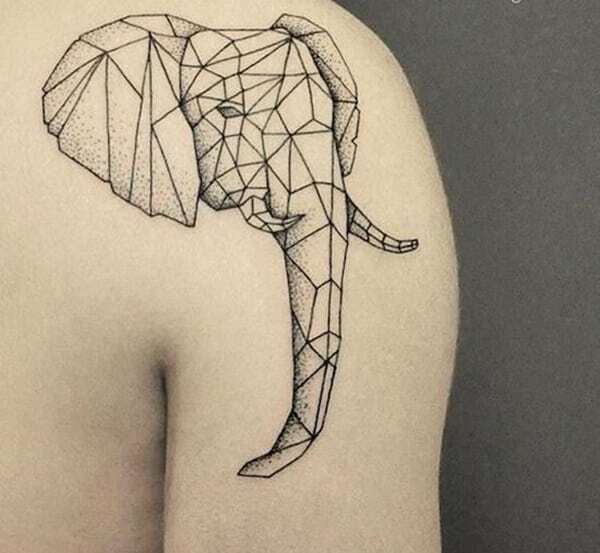 Another example of a geometric design that has a side profile of the elephant. It’s just the head, but it creates a great overall design. 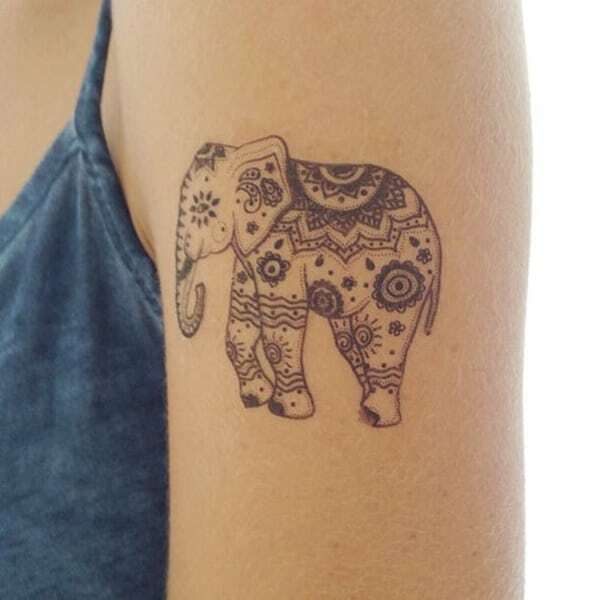 If you want to try a small tattoo then why not this cute ornate design? 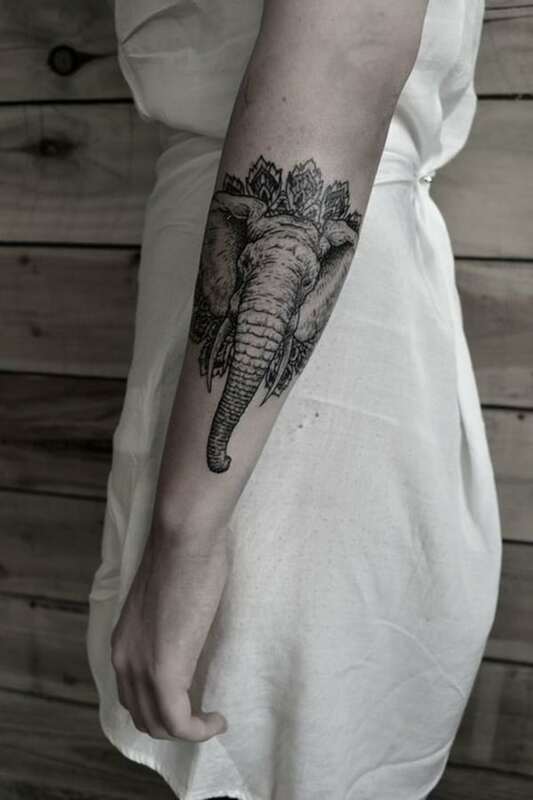 This walking elephant looks charming as it strolls along the arm. It has a lot of detail, and it’s a smaller design. Elephants are one of the most respected animals on the planet, and it might be due to a look like this. 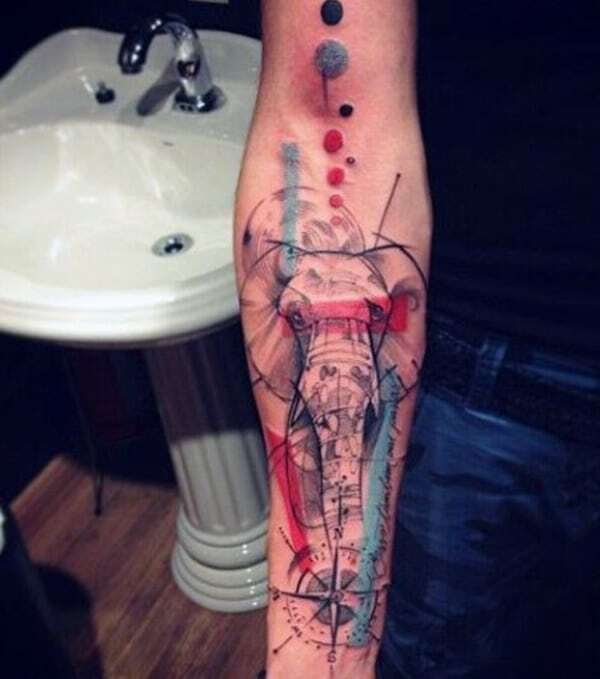 If you are looking fro a great sleeve tattoo, then check this detailed design out. The elephant looks mighty and strong like nothing could stand in its way. 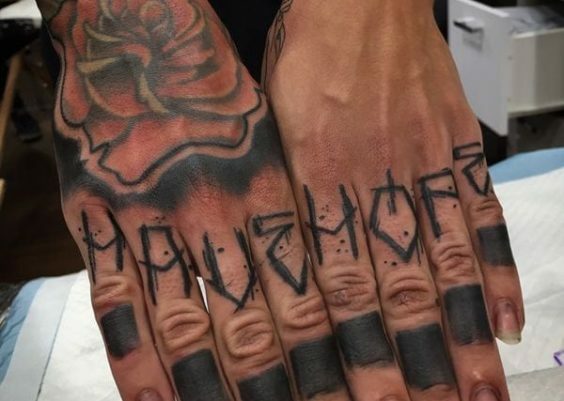 A great tattoo choice because of its uniqueness. 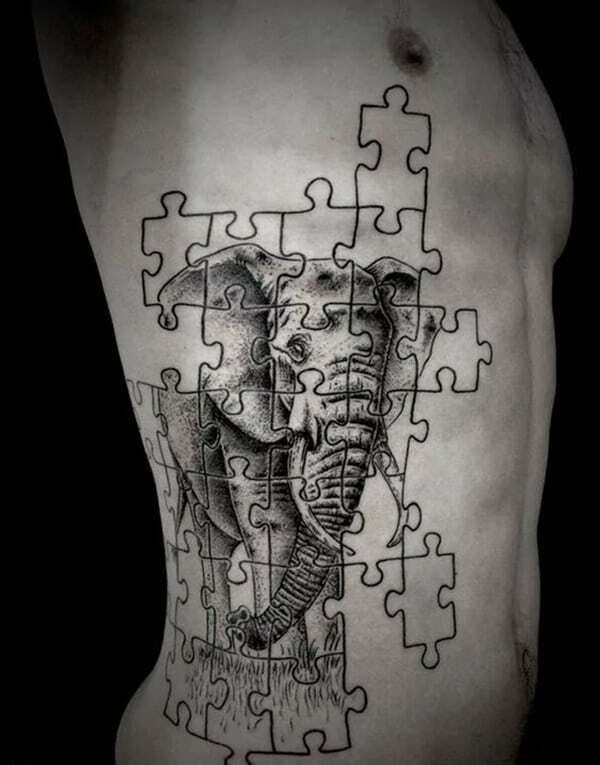 This tattoo has an elephant within its pieces, and you essentially build it on your body. This design could represent the number of family members in your own family. There’s a mother and father and a few babies. 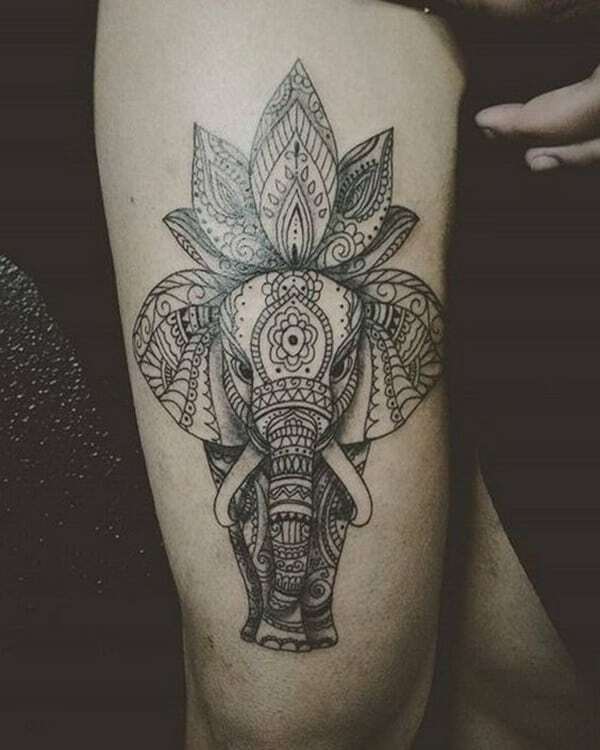 A great tattoo design that has half a shaded element amongst some shapes. 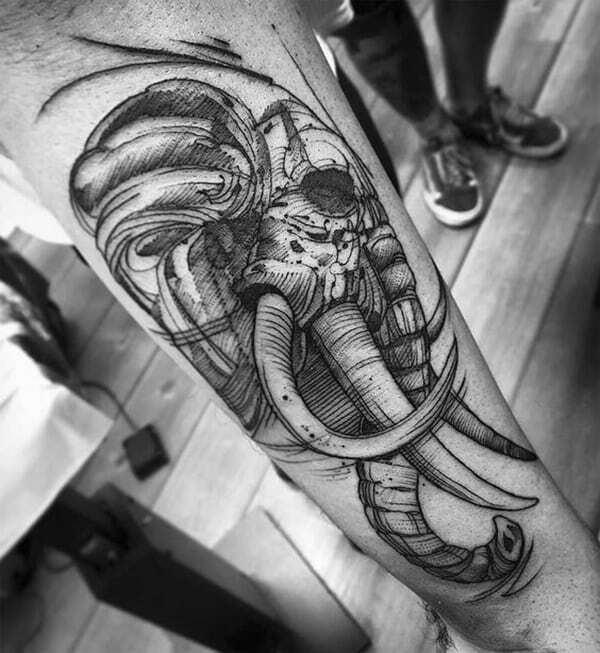 This is a very dark tattoo design that has a detailed elephant with a headpiece. The trunk goes down the finger to create the illusion that the trunk is actually picking up pieces. Like the pencils in this picture. 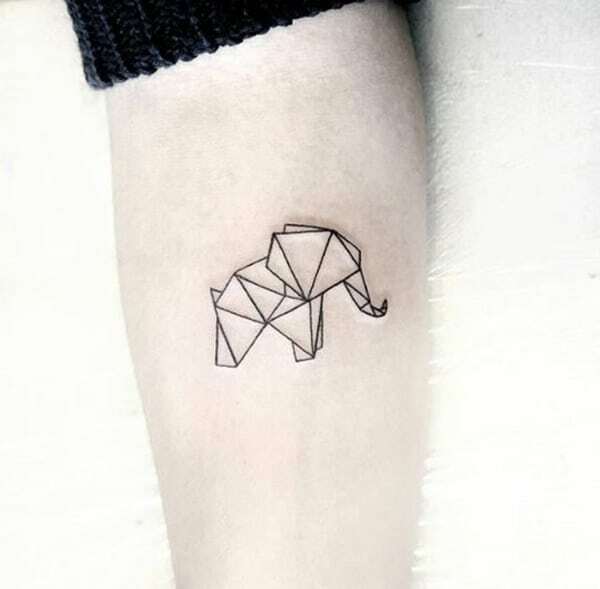 This design looks more like a drawing than a tattoo. The detail is amazing. 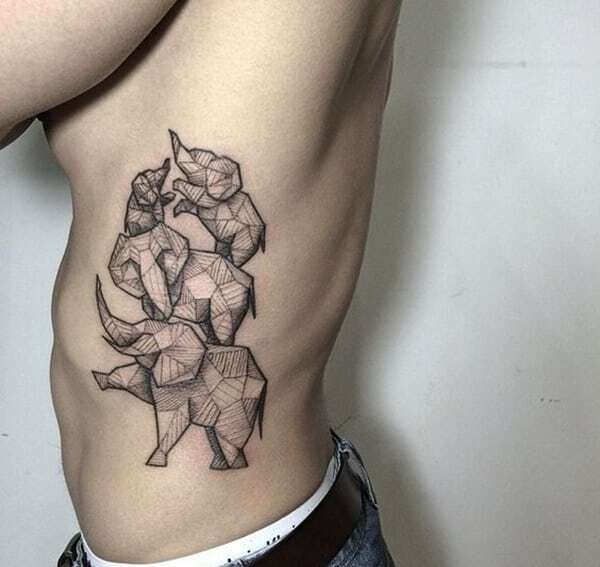 This tattoo is a geometric shape, but it also has some origami elements to it. I love these designs because they are so original. Another great example of an origami design, this one is small and black. It fits nicely on the shoulder. 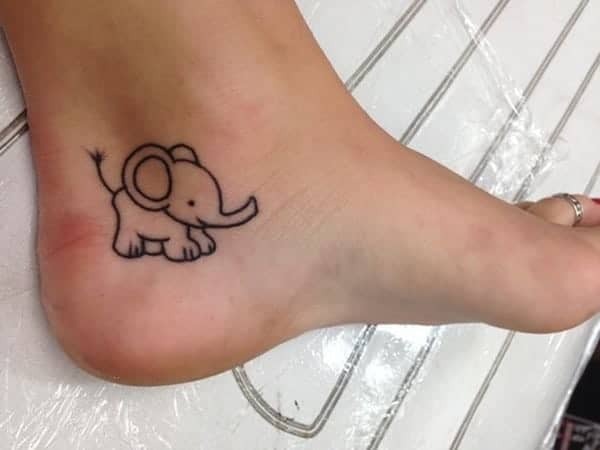 Another great tattoo that implements a darling little elephant. The head of this elephant is fierce, and a little scary. 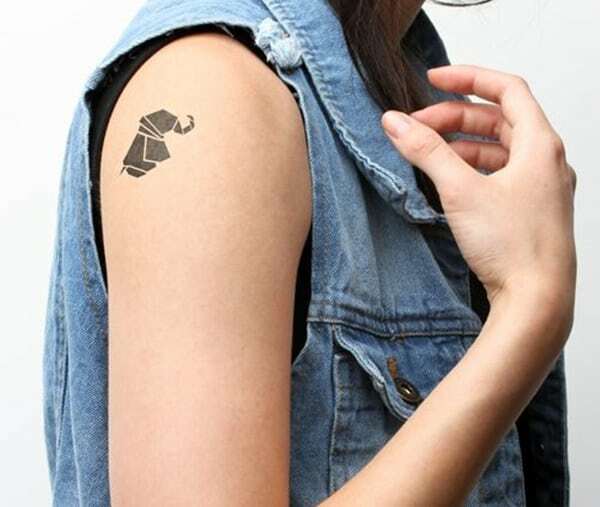 It fits perfectly along the bicep creating a great design. This sweet elephant just wants to send love out to others, and we are ready to take it. No one can deny the beauty of this tattoo design. 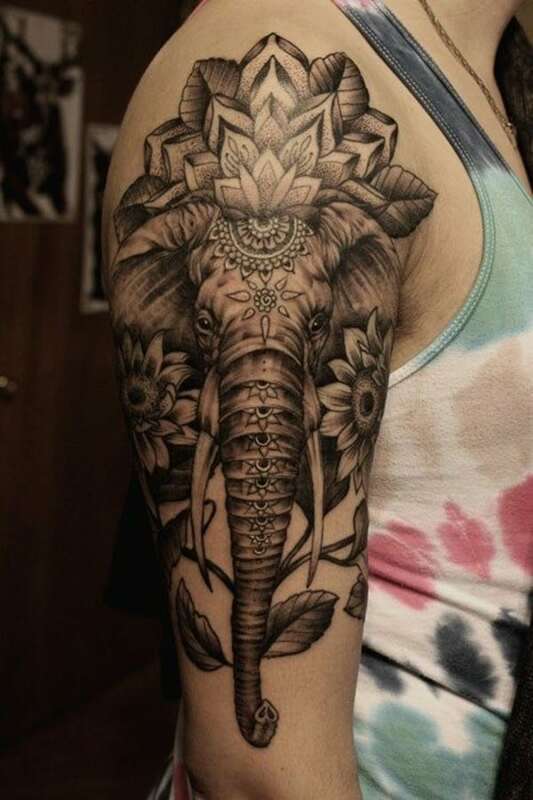 The detail and the intricate elements inside make for a great tattoo. A simple design that fits right on the finger. 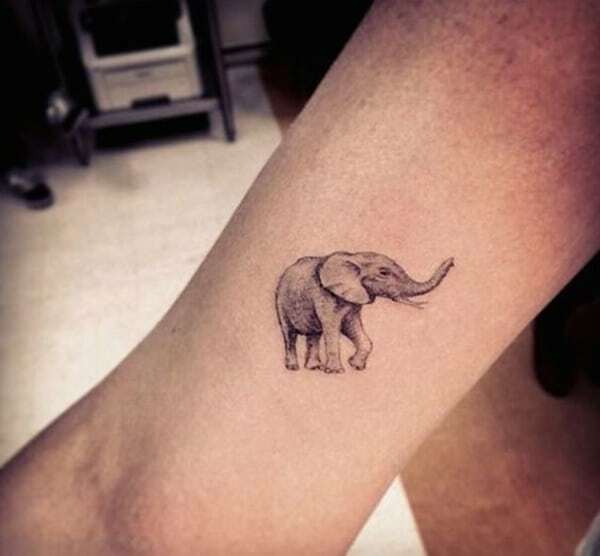 If you are looking for a small tattoo that won’t take up much room, then try out this design. 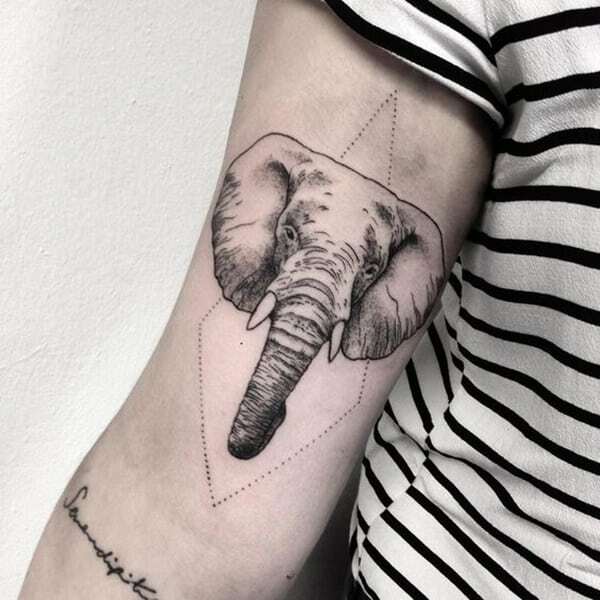 Another great example of the geometric half and half elephant. The detailed side has more jeweled elements in this design. I love the creativity involved in these types of tattoos; they are just so beautiful. 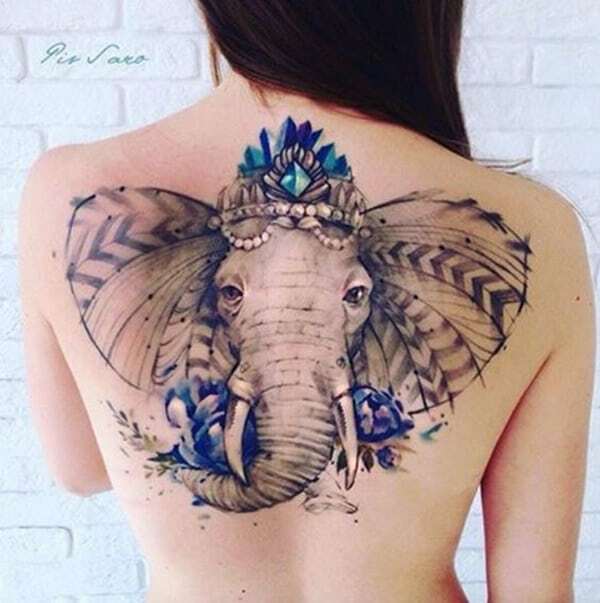 A great elephant design with plenty of details. A large tattoo that has many elements to it. 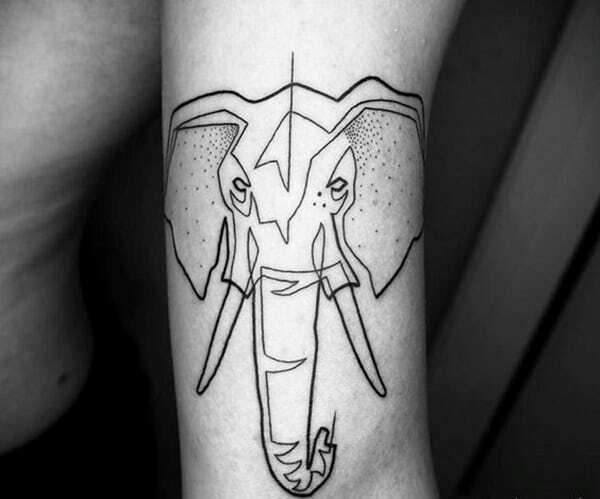 A great tattoo design that looks more like a drawing. These dark designs look great together. This 3D design is a geometric one, and it’s awesome. It jumps off the skin and is shaded perfectly. 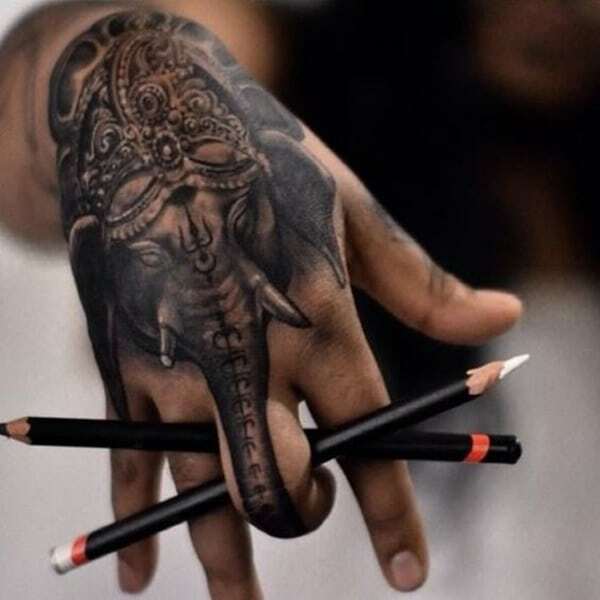 A cool design for anyone looking for a 3D tattoo. 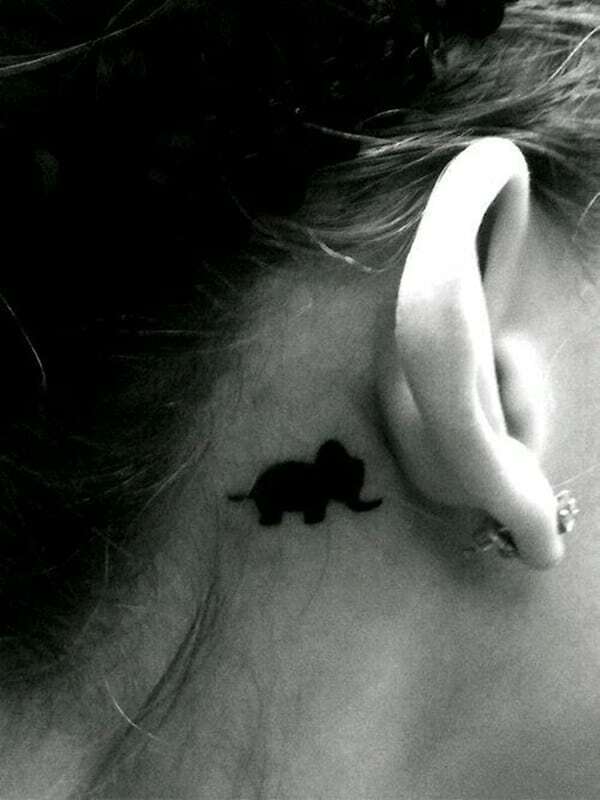 A silhouette of a tiny elephant that fits snugly behind the ear. 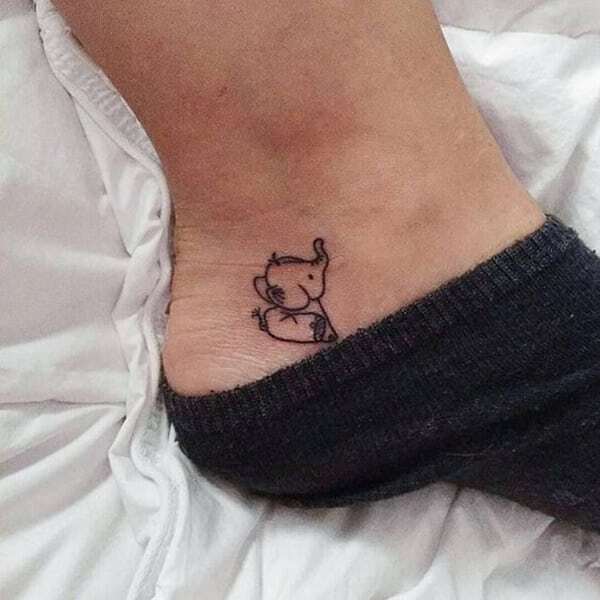 It’s a cute tattoo design. 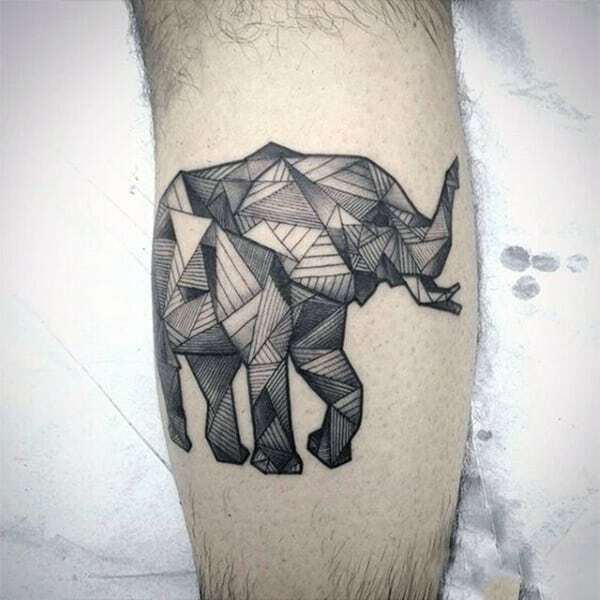 A great tattoo design that is another great example of a geometric design. 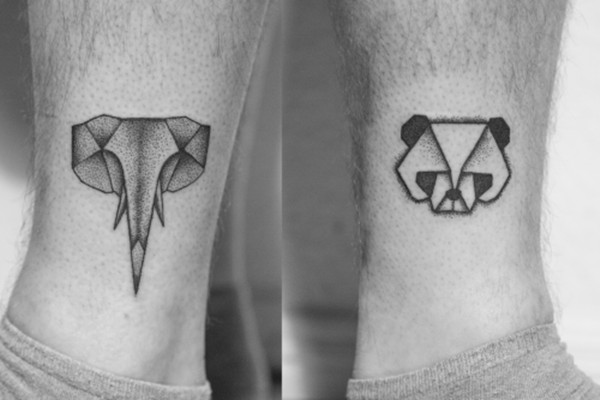 These tattoos are very popular because they look really cool. 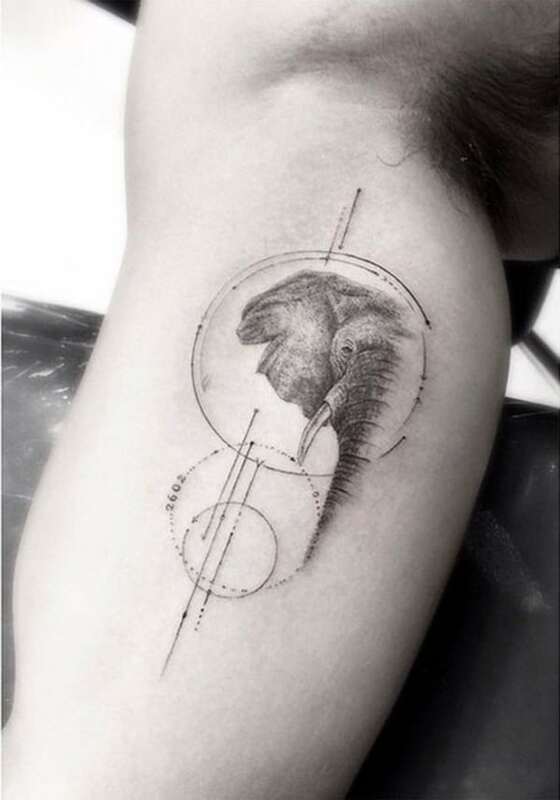 This great tattoo design is very unique because it is created through the word elephant. 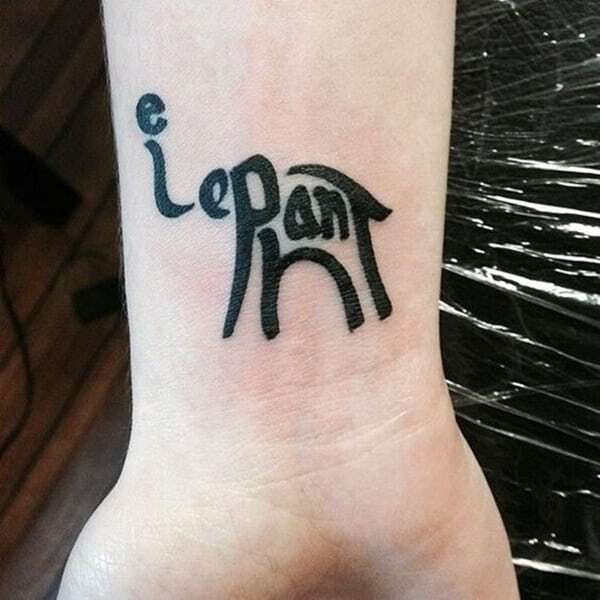 The elephant is made with trunk and all through the letters. 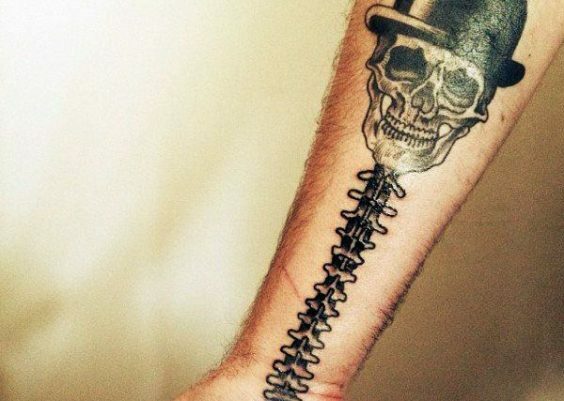 If you are looking for something different, this might be the tattoo for you. 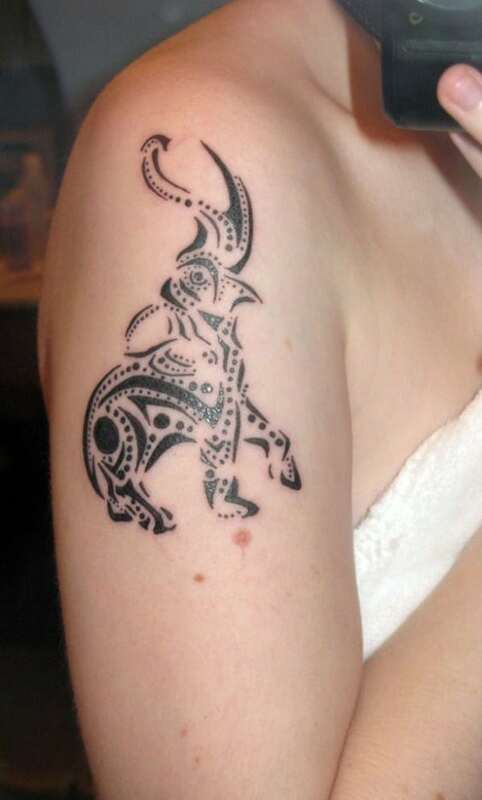 This elegant tattoo is stunning because it has some white ink elements to it that make the whole tattoo sparkle. It’s a wonderful design that is going to catch the eye for sure. 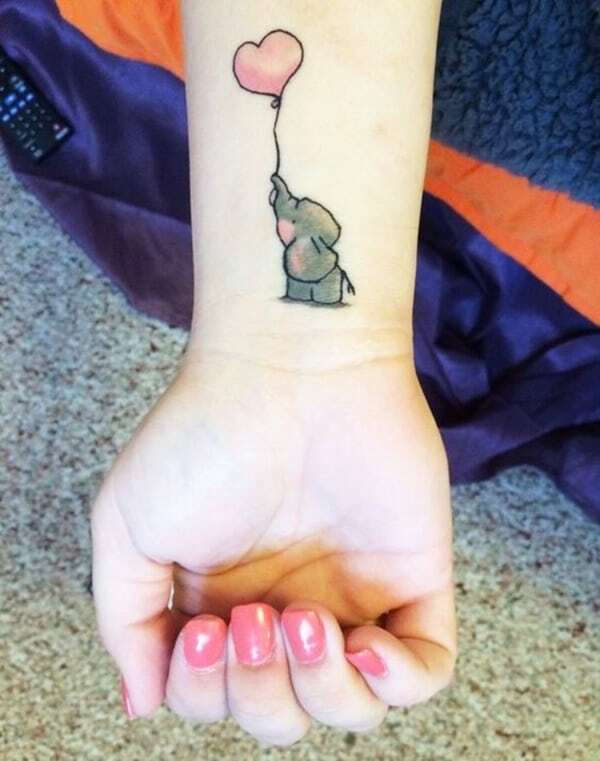 This sweet design shows a baby elephant holding onto a heart-shaped balloon. 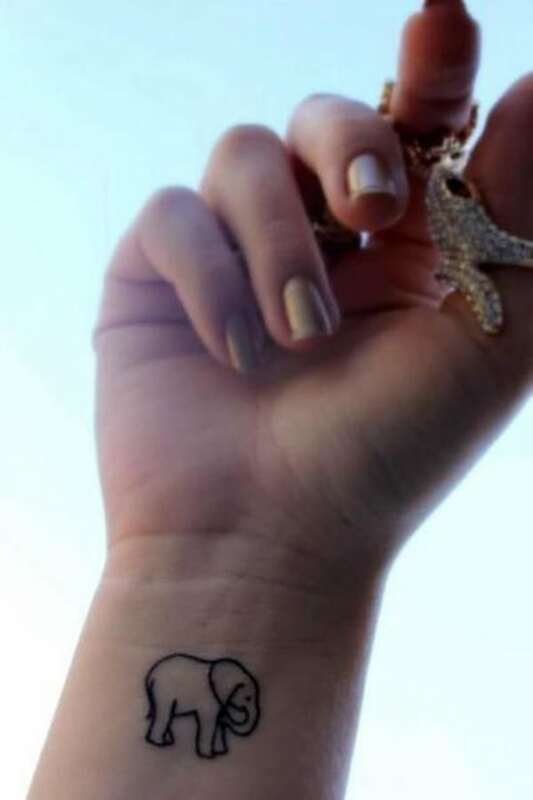 It’s a cute little tattoo design. 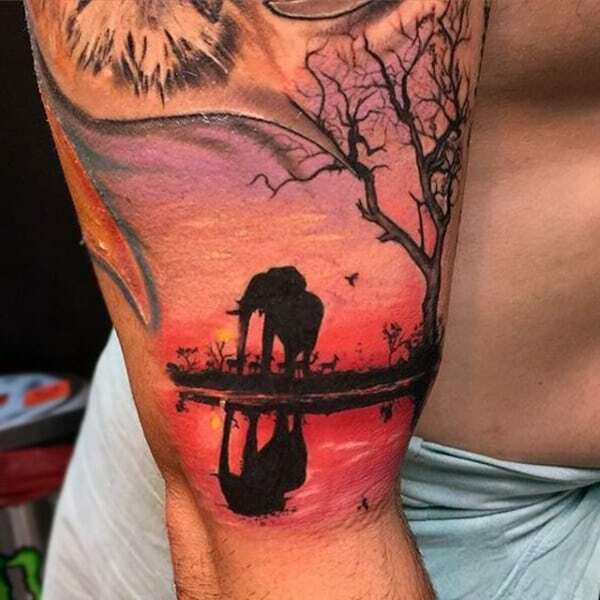 A great tattoo that shows Africa and it’s elephants. The colors are that of a sunset and they look incredible. 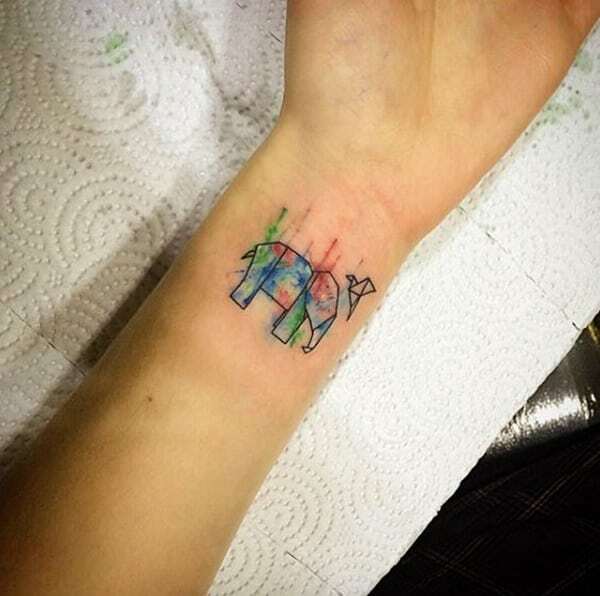 If you like a colorful tattoo for your arm, then this would be a great one. 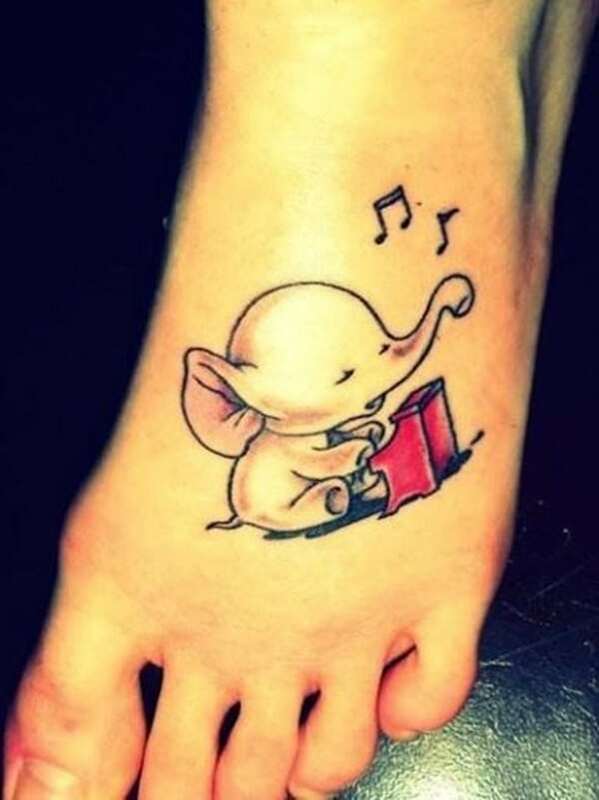 Another cute elephant design and this one shows the elephant playing piano. If you want a cute design that’s cartoonish, then this is the one for you. This family of elephants is playing with each other. It’s a great example of a geometric design. Some elephants are small while others are bigger. 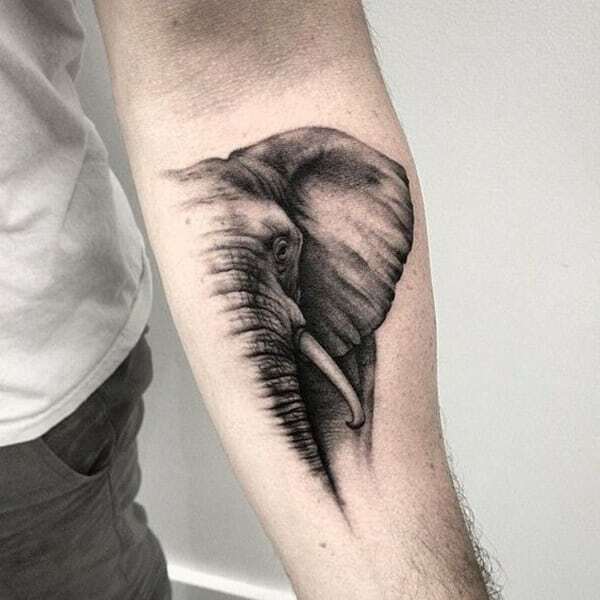 If you are looking for a realistic design of an elephant, this is a great one. It’s just a head that sits on a bed of flowers, and there is a lot of detail to it. 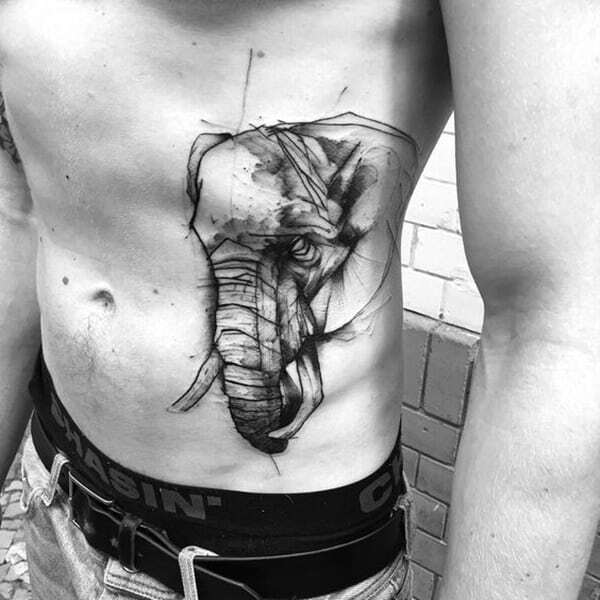 This elephant tattoo is just a sketch, and it looks incredible. It’s a ribcage tattoo that looks great if you want a large design. I love the detail and the originality of the design. 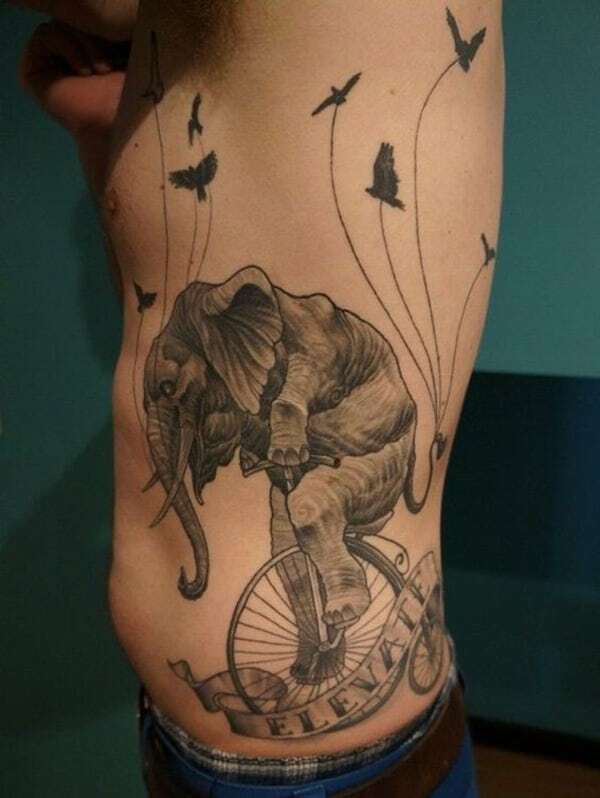 This elephant is doing some circus tricks on a bike, and it looks like he’s being carried away by birds. It’s a fun and original design. There’s a message to elevate on the tattoo as well. This is a great design because of the backsplash of colors. It’s another type of origami art, and it fits nicely on the wrist. 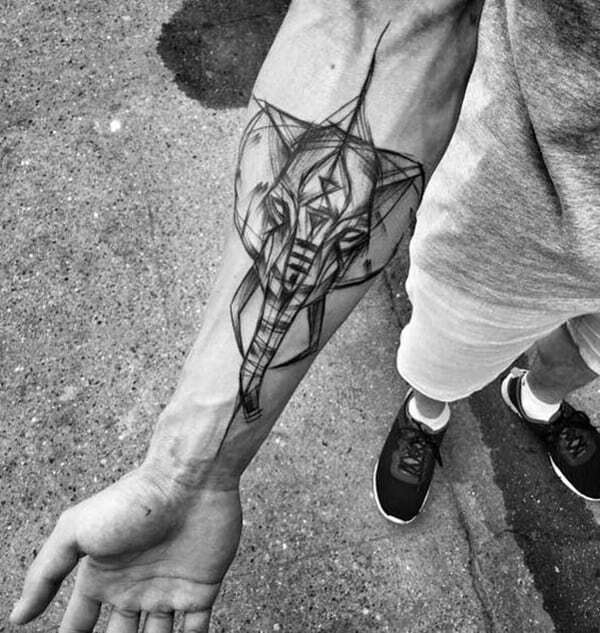 A great detailed elephant tattoo. 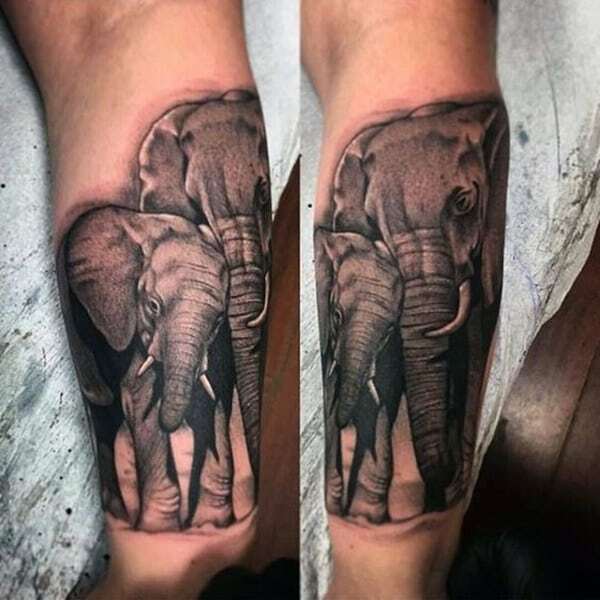 If you want a large design for a sleeve tattoo, then this design is a great choice. There is so much detail to the elephant as well as the other elements around it. 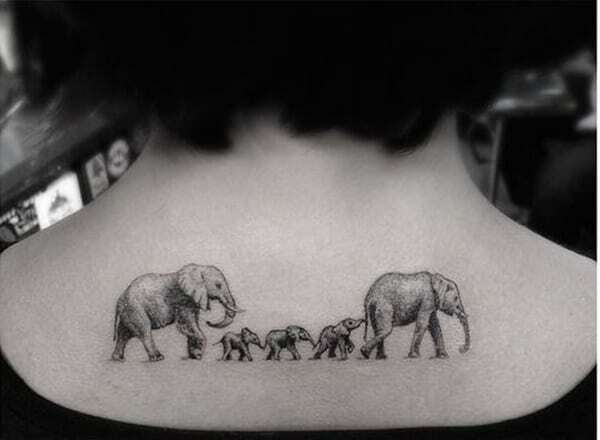 A great design that shows a herd of elephants walking along the arm. It’s a great design with lots of details. You will love this realistic design for a long time. 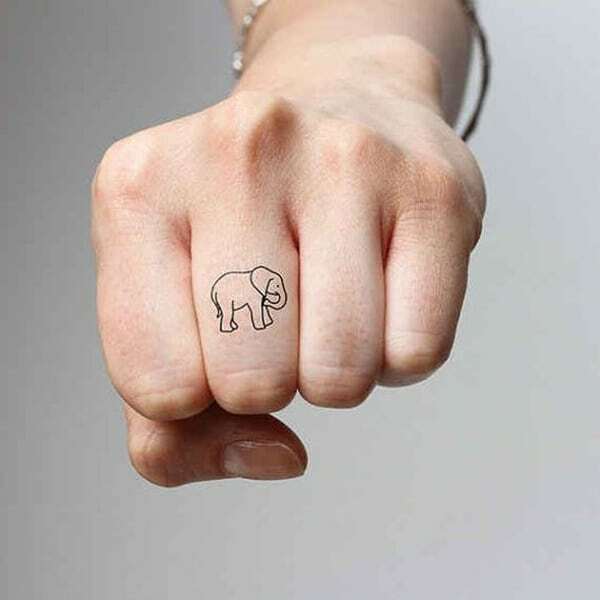 If you want a small and simple design of your favorite animal, then this might be a great choice for you. This elephant looks fierce and more than a little badass. I love the sketchy lines that it has. 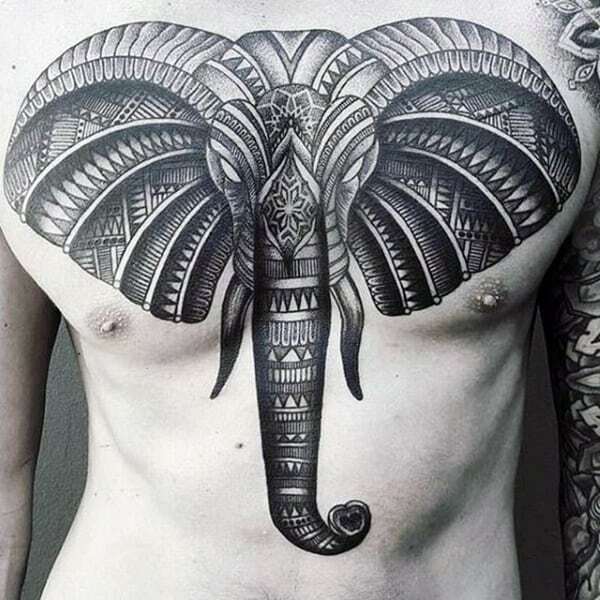 It’s a great tattoo design if you are looking for a big one. This black and white design looks amazing overall. 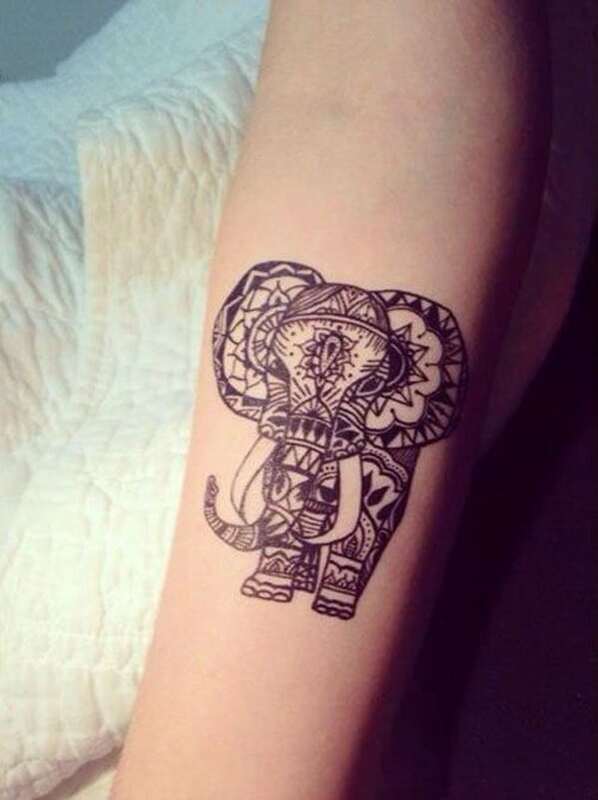 If you are looking for a different elephant design, then you might just love this one. This is an exquisite design for the back. The elephant looks so real, and the image really stands out. The coloring is the best part of this tattoo design. The different blues are breathtaking.